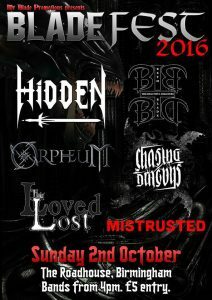 Hidden, Chasing Dragons, Beth Blade and The Beautiful Disasters, Orpheum, The Loved and Lost, Mistrusted + a mystery band! 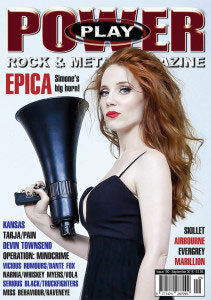 Tickets are available from the Official Orpheum Store. 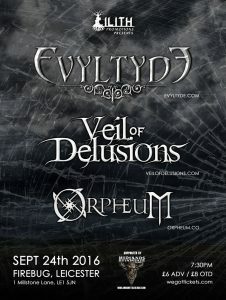 Tomorrow we head to Leicester for the first time, when we shall be playing at the Firebug with our fellow Londoner’s Evyltyde and from the Netherlands, Veil of Delusions. Tickets are available from WeGotTickets.com or on the door. Leicester, we’ll see you tomorrow! We have a new live date to announce, we shall be supporting William Control on his UK tour on Friday 16th September at The Crowndale (Purple Turtle) in Camden, London. This adds one stop before our dates in Leicester on Saturday 24th September at Firebug and Birmingham on Sunday 2nd October at Mr Bladefest 2016 at The Roadhouse. Head over to the Official Orpheum Store to pick up your tickets for London and Birmingham at the lowest prices available, for a limited time only!